PfAP2-I Is a Nuclear Protein that May Bind a Conserved TGCA DNA Motif Upstream of Some Invasion Genes. 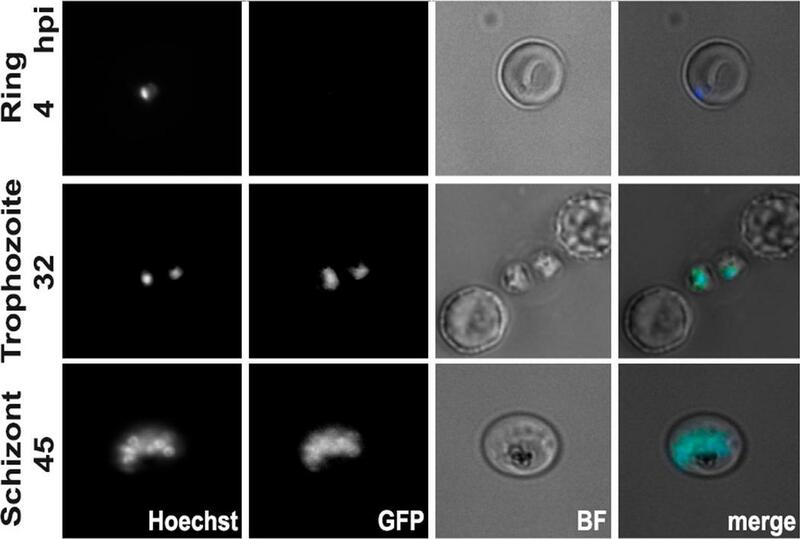 Live fluorescence microscopy of synchronized parasites shows that PfAP2-I-GFP (see Figure S1B) localizes to the nucleus of trophozoite and schizont stage parasites but is not detected in ring stages. Hoechst was used as a nuclear marker. Live microscopy and nuclear fractionation assays show that PfAP2-I localizes exclusively to the nucleus of trophozoite and schizont stage parasites.Santos JM, Josling G, Ross P, Joshi P, Orchard L, Campbell T, Schieler A, Cristea IM, Llinás M. Red Blood Cell Invasion by the Malaria Parasite Is Coordinated by the PfAP2-I Transcription Factor. Cell Host Microbe. 2017 21(6).